This girl must have gotten her feather tattoo inspiration from Demi Lovato. 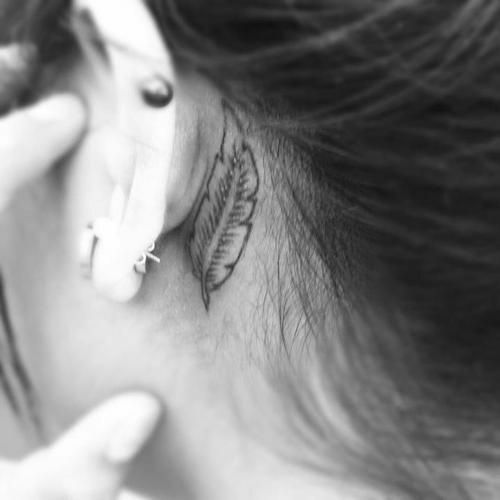 Like the pop star, this girl got a small feather tattoo inked behind her right ear, and also like Demi Lovato, this feather tattoo looks more like a leaf than a feather. 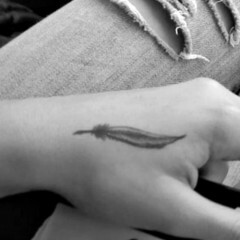 Either way, the feather tat is inked in black and white (unlike Demi’s, which is turquoise) and features a very simple outline of a feather, making the behind-the-ear tat pretty discreet. The cute feather tattoo could mean any number of things for this girl, but its partially hidden location gives the impression that the ink is pretty personal. 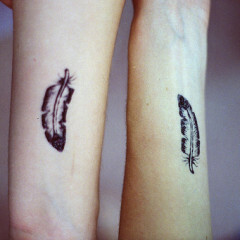 For many people, a black and white feather tattoo symbolizes freedom, strength or spirituality. 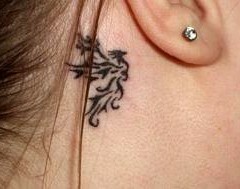 For others, the feather tattoo meaning could represent honor, loyalty, beauty or innocence.